Herbs, perennial, solitary or cespitose, rhizomatous, coarse. 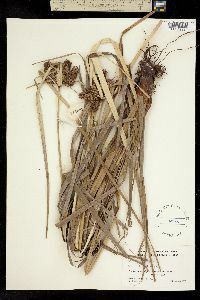 Culms trigonous, (30-)60-130 cm × 1-4(-9) mm, densely papillose, otherwise glabrous. Leaves with cross ribs prominent, V-shaped, 30-100 cm × 5-13(-20) mm, margins, keel incisive with brownish prickles, papillose throughout, margins and midribs harshly scabrid. Inflorescences: spikes 3-7, densely oblong-cylindric to ± globose, 10-28(-35) × 8-12(-15) mm; rays 5-12, 1-16 cm, densely papillose; bracts 5-12, ascending at 30-75°, flat to V-shaped, 4-50(-90) cm × 1-15 mm; rachilla deciduous, wings persistent, (0.2-)0.3-0.5(-0.6) mm. Spikelets 20-80, oblong-ellipsoid, ± terete, slightly compressed, 3-7 × 1-2(-2.7) mm; distal spikelets spreading or ascending; floral scales (2-)4-7, appressed, clear to brownish, reddish streaked, medially green, 9-11-ribbed, ovate, (2-)2.5-3.3 × 1.2-2.3 mm, apex acute, mucronate. Flowers: anthers 0.6-0.8 mm, styles 0.5-1 mm; stigmas 1-2.3 mm. Achenes brown, slightly stipitate, obovoid to broadly ellipsoid, (1.2-)1.5-1.6(-1.7) × 0.6-0.8 mm, apex apiculate, surfaces puncticulate. Fruiting throughout the year. Beaches, brackish marshes, mangrove swamps, disturbed soils, ditches, riverbanks, coastal croplands; 0 m; Fla.; Mexico; Central America; South America; w Africa. The papillose culms, rays, and leaves of Cyperus ligularis distinguish it from all other North American species of Cyperus. 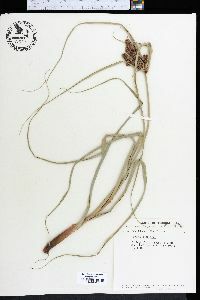 Reports of Cyperus ligularis from California (G. C. Tucker 1993b) were based on specimens of C. owanii.